Whisper Wall is scored for twelve musicians situated around the audience. It was premiered by the ICE ensemble in May of 2005. The text is comprised of names and words drawn primarily from the art works of Cy Twombly and Jean-Michel Basquiat. The first sounds of the piece are the whispered names “Cy” and “Samo”. Samo was the pseudonym Basquiat used to sign various graffiti messages that he posted throughout New York during the late 70’s and early 80’s. During the 80’s Basquiat gained fame as a painter whose aesthetic incorporated certain graffiti-like images. 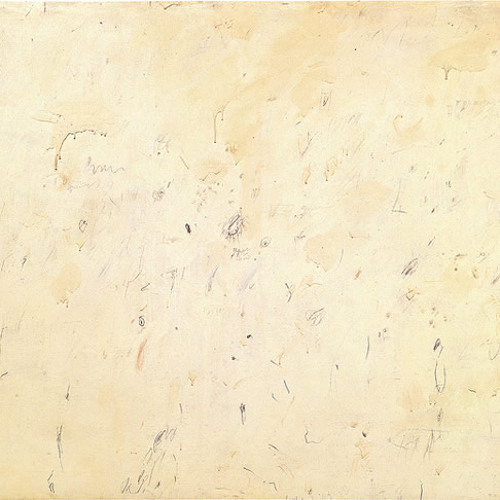 Some of Twombly’s works have also been likened to graffiti. Both artists infuse their paintings with names, poetry and other textual references. Basquiat frequently honors his own contemporary African-American heroes (names used in Whisper Wall) such as Joe Louis, Sugar Ray Robinson and Jackie Robinson. Twombly on the other hand focuses on the heroes and gods of the ancient world. Among them (also included in Whisper Wall) are Sesostris (pharaoh from the 12th dynasty) and Proteus (god of the sea). Some of the other names and words used in Whisper Wall are intended to bridge past and present as well as the literal and spiritual. The title of T.S. Eliot’s Burnt Norton appears in the musical text. The poem begins, “Time present and time past/Are both perhaps present in time future”. The word “shaman”, or one who serves as an intermediary between the physical world and that of the spirits, is also included. These terms are but a few of those used throughout. It should be noted that the selected words are utilized for thematic as well as sonic purposes. Many of the words at the outset of the piece emphasize “s” and “sh”. These phonetic sounds are placed within the context of complimentary musical textures such as sandpaper being rubbed against wood and cardboard. Thus the text generates music and vice versa. Likewise, text in the paintings of Twombly and Basquiat transcends mere verbal messages and becomes an important visual subject matter. Finally, the idea of temporal suspension not only dominates the textual content, but the music as well. While the context of the musical materials may be contemporary, the primitive nature of the sounds yields yet another connection to the distant past. I'm almost never attracted to "static" (I'm sure that is not the right word!) pieces, but around the midpoint I felt you had me locked in :) This strikes me as quite original.